I really enjoy the flavours of Mexican and Texmex cuisine and I am always on the look out for new dishes. I recently came across the concept of carnitas. Carnitas are made by braising the meat, typically pork, in a seasoned liquid until it is tender enough to shred. After the meat is shredded it baked at high heat to turn the edges of the meat crispy while the inside stays nice and tender. After the meat has been prepared it can be used in tacos, burritos, enchiladas, etc. The recipe that I came across was for salsa verde carnitas . There was no way that I could resist trying pulled pork braised in salsa verde and then baked until slightly crisp and yet still tender. I used some home made salsa verde that I had made with some tomatillos that I had in the freezer. The carnitas turned out pretty good. The meat was really flavourful and I enjoyed the combination of crisp and tender textures. 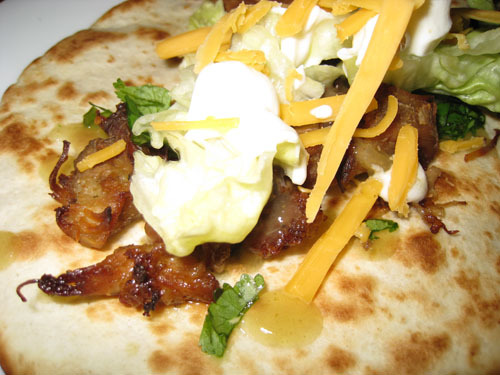 I used the carnitas meat in a simple taco with lettuce, cilantro, shredded cheese and sour cream. I really look forward to using carnitas meat in other dishes in the future. Trim the excess fat from the pork. Place the pork, onion, salsa verde, chicken stock, cumin and oregano in a pot. Bring to a boil, reduce the heat and simmer until the pork is nice and tender, about 3-6 hours. Take the pork out of the liquid and shred the meat with a pair of forks. Bake the shredded pork in a preheated 400F/200C oven until just browned and slightly crispy. Skim the fat from the liquid. Bring the liquid to a boil, reduce the heat and simmer to reduce for about 10 minutes. Mix the pork back into the liquid. Use the pork mixture in your favorite tacos, burritos, enchiladas, etc. Note: Can be used as a filling in burritos. mmmmmmm, this looks too good 🙂 makes me want a margarita. Okay, seriously…do you ever STOP cooking?? This looks so good and I’m with javagirl…bring on the margaritas!! 1) I can’t believe I’ve never made carnitas before, given that my husband grew up in a Mexican household. 2) I’ve never seen carnitas made this way, I’ve always seen it roasted, not boiled. This looks like a great way to reduce the fat (and the photo looks delicious!). This sounds fabulous and I do like the ingredients here. big kisses from kitchen kevin and my warmest message of love, happy valentine’s day!! This looks like one of the tastiest dishes yet!! I tried “pulled beef” for the first time last week. I am assuming it’s the same thing as carnitas. Thanks for the recipe, I would like to try this, but with chicken or beef. These sound delicious. I find myself eating more and more Mexican style food. I just can’t get enough of salsa, cheese, tortillas, and avocado. yum! i love carnitas! what do you NOT have handy in your freezer? That looks absolutely lovely. I can’t wait to try it. Everything about this looks great Kevin! I would eat this up! I made this for dinner last night with the cilantro-lime rice and it was super tasty! I had to use jarred salsa verde but I’m still pretty happy with the results! Once we get a new food processor (I killed our old one) I’ll try with fresh-made!